Click here for a printable troubleshooting card for quick reference. For further troubleshooting, contact Customer Service or your Wire Wizard® Technical Sales Manager. Ensure conduit end is countersunk. Use countersink tool (pt. # EC-DB) for polymer conduit or a stone bit for steel lined flexible conduit. Improper fitting used, ensure fitting is a Wire Wizard® connector with rounded shoulders on inner diameter. Air & fluid fittings are not designed for wire delivery. 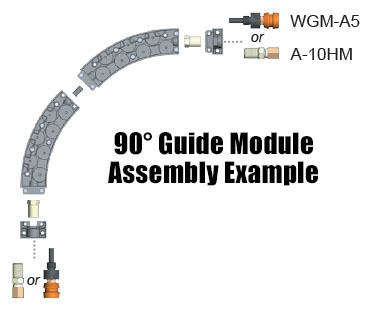 Ensure conduit has not been overtightened or crushed at any connection points (if using Guide Modules, see A-10HM note below assembly drawing). For installations with Wire Guide Modules, bend wire end over tightly or use guide cap to feed wire to the feeder (caps required for cored wire). Ensure Guide Modules (if applicable) are installed properly. Conduit must be pushed far enough into the Module and only A-10HM or WGM-A5 connectors should be used to attach conduit. Guide Modules must be installed properly to ensure trouble free wire delivery (90° Guide Module assembly example shown above). If using A-10HM style fitting, tighten connector on Module before inserting conduit. Conduit should be inserted until it bottoms out. Tighten ferrule connection to secure conduit. Self-threading connector installed on an angle or not tight enough. Reinstall and firmly tighten with box wrench until fully seated. Compression ferrule is installed upside down. Replace or reinstall ferrule in correct orientation (orientation is the same for all conduit). Self-threading fitting used in a moving/robotic application. Replace with a compression style fitting. Strain relief connectors are also recommended to reduce stress on conduit. Conduit does not have enough slack to avoid detachment from connector in robotic applications. Install longer conduit section to allow for more slack. Use a conduit balancer to secure conduit above robot to avoid areas where it may be at risk of being pulled. Conduit is worn and needs replacing. Symptoms often include shaking, intermittent burn-backs and/or arc failures and erratic wire feeder motor amperage. Verify pull force at the feeder is not more than 2 lbs when conduit is replaced. Torch liner is worn and needs replacing. Replace liner. Conduit is grooved due to excess wire friction. Bend radius within the delivery system may be too tight. Adjust conduit setup to reduce bend radius or install Wire Guide Modules. Verify pull force is not more than 2 lbs at feeder after adjustments have been made. If wire pull force is over 2 lbs at the feeder, the system may require Wire Guide Modules or a different wire delivery setup. Contact customer service for additional support. Wire delivery system may have excess dirt or debris. Inspect system and clean. Wire Guide Modules may be cleaned by disassembling and wiping with a dry rag or blasted with compressed air. Insulate quick couplers, brackets and connectors to ensure there is no contact with metal surfaces. Straighten or shorten conduit between Guide Modules. Inspect inlet/outlet probes, as well as intermediate pins (inserted between connected modules) for wear, replace if needed. Refer to Guide Module instructions to ensure proper installation & for additional details. Wire may be tangled inside drum. Untangle wire and consult wire manufacturer. Orbital Arm Kits are available to prevent wire tangling inside certain drum packages. Check wire feeder drive rolls and ensure proper function, adjust or replace if necessary. Inspect wire delivery system for wire hang-ups. Replace any worn conduit, liners or connectors and verify proper installation. Excess wire pull force may exceed wire feeder capabilities. Friction may be reduced by installing Wire Guide Modules at bends and corners in the delivery system and/or by installing a Pneumatic Wire Feed Assist. Contact customer service for additional support. “Birdnesting” is a common problem with aluminum and light steel wires with weaker column strength. 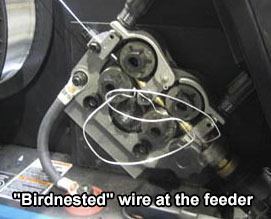 A Wire Pilot® Feed Assist is highly recommended for these applications to eliminate friction and other problems inside the wire delivery system that can cause the wire to birdnest. Dirty wire is often caused by wire exposed to the industrial environment. Ensure wire is properly covered with a drum hood, or a wood reel cover if dispensing wire from wood reels. Covers are also available for turn tables commonly used in submerged arc applications. Check wire delivery system for excess dirt, oils and debris. Replace conduit with excessive grease or drawing compound build-up. Consult wire manufacturer if problem persists. Some wires may have excess drawing compound from the wire manufacturing process that can potentially cause problems in certain welding applications. Sign up for our monthly Word from the Wizard newsletter and stay up to date on the latest products, news and events. © Copyright ELCo Enterprises, Inc. All Rights Reserved.